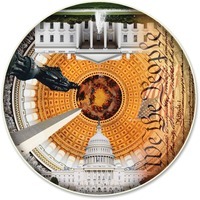 Part of the Round Table Collection, the USA Capital Puzzle is ideal for groups of two or more. Circular puzzles have the top of the image in the center and the bottom of the image around the entire circle so everyone has an equal seat around the puzzle. As you work your way around this puzzle, you visit some of this country's greatest landmarks and get in the spirit that inspired the Constitution of the United States. Embrace the very words, and they're embodied in U.S. nation's Capital architecture and monuments in an inspirational puzzle experience. The 500 piece puzzle is designed for participants ages 8 and up.